Maureen Swenson knew a lot of women wanted to learn how to workout and eat healthy. She took a plunge and posted on the Ankeny swap Facebook page looking for women who would be interested in learning about fitness from her. Who knew, 5 years later, this innocent post would have turned into a team of 8 best friends? Not these ladies, that’s for sure. If you’ve run Market to Market Relay Iowa in the last three years, you definitely know this group of running moms. Every year they run the entire race in some of the craziest costumes. This year you would have seen them dressed as the Village People dancing to “YMCA” at every exchange point. Last year, they were the grannies, where one woman ran with a pillow in her rear and balloons in her bra the entire day. As for the costume contest, these ladies haven’t taken the cake, yet. Every year they’ve been beaten by the same team of men. This year the team was WWF Wrestlers. Last year, they were the Secret Service. “They are our rivals. They have won it every single year. We love upping our game trying to beat those darn men,” team captain Erin King said. This year, the two teams met up in Linden to get their photo taken together. Their friendly rivalry makes the race more fun explained King. 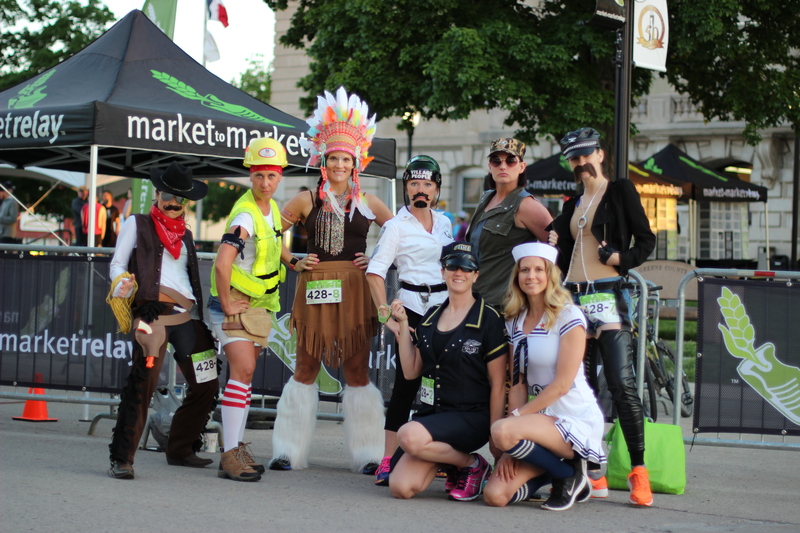 As the group of ladies ran the 2017 race, they were already coming up with fun and new ideas for their 2018 costumes. “Next year, my team wants me to be a character that has some stuffing and I just keep thinking about the heat,” said King.